The World Heritage Committee will be meeting in Cambodia: Iraq is a member, but the Iraqi marshes are not in the agenda! Home / Save the Tigris / The World Heritage Committee will be meeting in Cambodia: Iraq is a member, but the Iraqi marshes are not in the agenda! The Speaker of the Council of Representatives of Iraq Osama Nejaifi, and through him to all members of the Iraqi Parliament. The Iraqi Marshlands are considered both a cultural and natural heritage because of their outstanding value as the largest wetland in the Middle East and the home to the ‘Marsh Arabs’ with their distinct 5,000-year-old culture; the Marshlands of Mesopotamia are on the Tentative List of World Heritage sites submitted by Iraq since 2003. This heritage is in great danger mainly due to the construction of the Ilisu Dam on the Turkish stretch of the Tigris River. On March last year, our campaign: Save the Tigris and Iraqi Marshes launched a petition to the World Heritage Committee, urging them to assess the impacts of the Ilisu Dam construction on the World Heritage of the Mesopotamia region and to insist on the State Party to refrain from any action infringing upon any sites bearing the potential to become a World Heritage Site. We collected more than 40,000 signatures (online and offline); however, UNESCO has rejected our attempts to meet in order to deliver the signatures, claiming it is the Iraqi government´s jurisdiction. We see this response as a lack of urgency and commitment from the part of UNESCO. 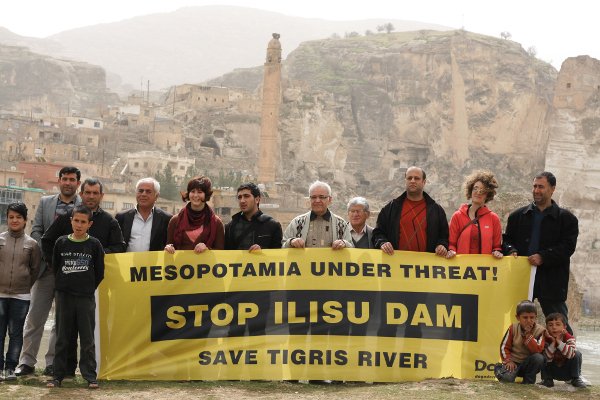 Following the petition, the Save the Tigris Campaign held a press conference where it launched an open letter to demand the Iraqi government to take all necessary steps to protect Iraqis’ right to water. One of the demands was that the Committee for the Submission of the Central Marshes as a World Heritage Site be transparent and report on its progress to the Iraqi public no later than June 2013. We asked the committee to submit a clear plan and timeline for the submission, however, there have been no efforts on the committee or the Iraqi government side to prioritize the central marshes submission or to release a deadline. Whatever are the technical difficulties it is still the responsibility of the committee to be transparent and inform of any progress or the reasons for delay. It is also the responsibility of UNESCO to facilitate and guide this process and to assist the committee in technical matters so they can submit the file. Yet it seems that dam construction is faster and that the marshes are due to dry before they reach the World Heritage Committee meeting for discussion. 1- we demand the Iraqi committee responsible to prepare the file to declare its plan and timetable referring to the progress made and the deadline to submit the file formally to the World Heritage Committee. 2- We demand UNESCO [Iraqi team and Headquarters} to engage in the protection of the marshlands, specifically to provide technical support to the Iraqi Committee and to demand expediency from the Iraqi Government in implementing demand 1.